The annual SUNY Purchase Culture Shock returns on April 28 and 29 and the lineup is looking pretty awesome. Purchase alumnus Mitski headlines day one, which also has The Front Bottoms, Saba, Katya Zamolodchikova, Sango, Screaming Females, White Lung, and Tasha the Amazon. 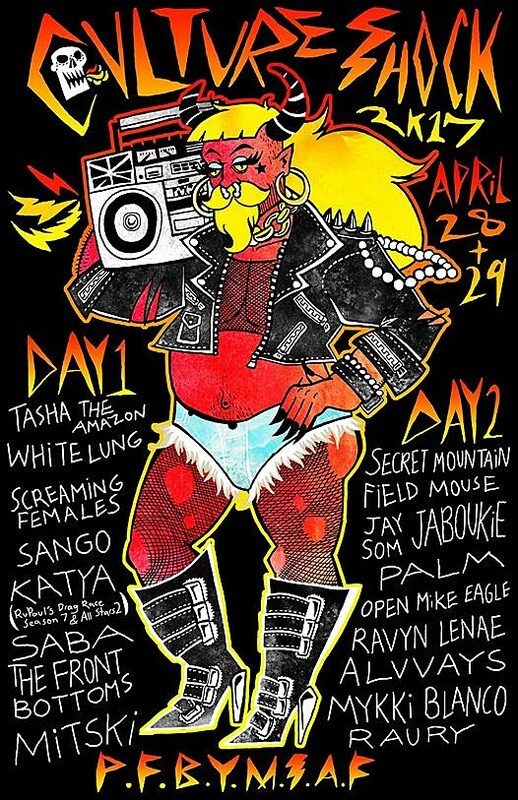 Raury headlines day two, which also has Mykki Blanco, Alvvays, Ravyn Lenae, Open Mike Eagle, Palm, Jaboukie Young-White, Jay Som, Field Mouse, and Secret Mountain. There’s also a Hip Hop Club afterparty in The Stood on Saturday with Zaytoven. Plus, there will be a ferris wheel, other rides, games, food trucks, and more all weekend. As always, Culture Shock is free for (and only open to) students and their guests. Alumni need to be registered as guests. More info here. Jay Som just played NYC and will be back in June for two more shows. White Lung have an upcoming NYC show too. Screaming Females play NYC right before Culture Shock. Mitski has several other dates, including NYC’s Panroama and a Brooklyn Steel show.